Ever since Supergirl announced that Erica Durance was taking over the part of Alura, I’ve been waiting for her to appear since we last saw her as Agent Noel back in “Midvale”. Finally in “Dark Side of the Moon”, Durance is back and this time not as an AI or J’onn in disguise. Before we get to the mother-daughter reunion, we are in space as Mon-el and Kara are travelling to the coordinates where the rock that can save Earth and save Reign is located. When they get there, the two find a civilization on top of an asteroid under a bubble floating away in space. Soon enough Kara and Mon-el are trapped by a tractor beam but get out of it when they turn J’onn’s ship into an asteroid. Upon landing, Mon-el uses his Legion ring to locate the black rock of Yudal Kal and in order to blend in, Mon-el grabs a couple of robes as the observe their surroundings. As they do, Kara talks to Mon-el about always having to have a disguise to blend and thinks it is a burden to never be herself. Mon-el counters that in the future, he lives in the open and it too is a burden. Eventually, Mon-el and Kara arrive at the location of the rock but Kara notices a Kryptonian monument that honours those lost in the Krypton explosion. Kara realizes they are in Argo City but before realization can fully set-in, Kara and Mon-el are surrounded by droids similar to the one that protects the Fortress of Solitude. Soon a woman’s voice tells the droids to stand down and emerging from the bushes is Alura, Kara’s mother. Mother-daughter immediately embrace in a hug and Alura shares that she survived thanks to a shield developed by Kara’s father that protected Argo City from Krypton’s destruction. Alura wonders how Kara is still alive as she saw her ship get sucked into the Phantom Zone. Kara tells her mom that while she was in the Phantom Zone for a while, she eventually made it out along with Kal-el who arrived first. Both apologize for not searching for the other but both understand that either knew they were alive. Alura wants to know why Kara is in Argo City if she didn’t know she was alive. Kara explains that three Worldkillers landed on Earth shortly after Krypton’s destruction and while she took care of two of them, the third Reign is seeking to destroy Earth and needs the black rock of Yudal Kal to stop her. Alura takes Mon-el and Kara to the block rock and tells them that the block rock is the only thing that is keeping everyone alive in Argo City and if they want a piece of the rock then they need to call a meeting of high council. While they await the meeting, Alura and Kara catch up. Kara pretty much tells her mom about season 1 of Supergirl in terms of the prisoners of Fort Rozz, including Astra and Non, escaping and terrorizing Earth. Alura admits in her shame in the role of sending the prisoners to Fort Rozz and also about not really understanding her sister Astra. 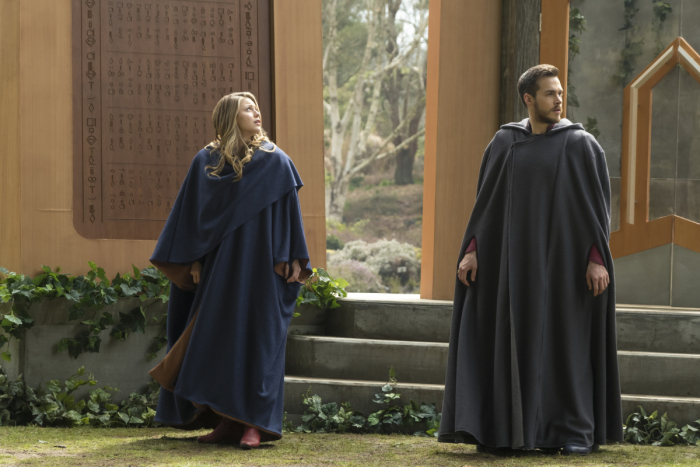 As mother-daughter catch-up, Mon-el is back at the market where he borrowed the cloaks and meets a mother of the son with breathing issues they spied earlier. Mon-el uses technology from the future that cures the boy of this breathing problems. When the meeting of the high council arrives, we immediately recognize one of the members as the dark kryptonian that has been guiding Reign and the other Worldkillers. Here we learn her name is Selina. One member (who I will call Tukov because he is played by the same actor that played that character in Star Trek Voyager) is against Kara from taking a piece of the black rock. However, Kara gives an impassioned speech to the members on why the council should save Earth. It is out to a vote and Tuvok and a few others vote against helping Earth while Alura and the rest of the council vote to help. It seems to be a tie and it is up to Selina to break it and she votes to help Earth. We see Selina give the rock to Kara and before she and Mon-el leave, Alura gives Kara a box. The two give a final hug but the two know that they will see each other again. Before Kara leaves, Alura tells her daughter to go and be a hero. When Alura did that, it totally reminded me of when Lois used to that to Clark in Smallville. And I have this feeling the rock that Selina gave Kara isn’t going to work since she is league with Reign. While out with Ruby, someone tries to kill Alex with a grenade that she quickly dispatches. Alex, Winn and J’onn go through likely suspects and target Sheriff Collins. If you recall, Collins was Alex’s first arrest at 17 when she nabbed him for killing Kenny Lee in “Midvale”. However, it ends up being a brother of a Fort Rozz prisoner that was after Alex. The whole point of this subplot was Alex trying reconcile being a badass along with her desire of being a mother. Meanwhile, Winn is stuck on babysitting duties with Ruby and is quite a jerk to her that she calls him on it. Winn and Ruby then bond over their fears of becoming like their evil parents. Finally, Reign in taunting Lena who isn’t taking the bait but it gets to the point where Lena overdoses her with kryptonite. Unfortunately, Reign looks to be immuned and breaks free of her jail cell just as Mon-el and Kara return with the rock. And next week, it looks like Kara goes back to Argo City to be with her mother for good. However, it makes no sense that Kara would leave Earth when Reign is still a threat. The promos sure indicate that Kara is leaving Earth high and dry. Also, I am waiting for Mon-el and Kara to get back together so hopefully that happens soon. Another prediction I am going to make but I hope is not true is that Alura is going to die by season’s end. I really don’t want that to happen as that means no more Erica Durance on the show.